Born 10 or 11 January 1815 in Glasgow, Scotland; died 6 June 1891 in Ottawa, Ontario. A practicing lawyer, John A. Macdonald first entered politics at the local level as alderman on the Kingston Town Council. He entered provincial politics representing Kingston in the Legislative Assembly of the Province of Canada in 1844. He played a noteworthy role forming the 1854 Liberal-Conservative political alliance, a precursor to the modern Conservatives, setting a pattern of useful compromise and coalition-building that would characterize his career. Macdonald was joint premier of the Province of Canada, alongside first Étienne-Pascal Taché and later George-Étienne Cartier (1857-62), often confining his chief Upper Canada rival George Brown to opposition. Strategically, Macdonald was fighting a rearguard battle in Upper Canada, kept in government for long periods by his alliance with Cartier, but with his support increasingly undercut by the insurgent Reformer George Brown, with his demands for representation by population. A politician known for his adaptability, Macdonald for years had resisted Brown's calls for constitutional change, favouring an incrementalist approach waiting for "ripeness" of the question and the prospect of cross-party agreement. After the collapse of Macdonald's brief and final party-led Union government of 1864, Macdonald readily accepted Brown's offer of support to form a coalition government pledged to reform the constitution. Macdonald successfully negotiated a coalition agreement with Brown, pledging his government to seek a federation of all the British North American Provinces or, if unsuccessful, a federation of Upper and Lower Canada alone. Macdonald would play an important - perhaps the central - role in the Charlottetown, Quebec and London conferences leading to Confederation in 1867. He was the principal author of the Quebec Resolutions that formed the basis of Confederation. "Macdonald is a sly fox," wrote another Father of Confederation from London. "He is well-briefed, subtle, adroit and popular. He is the man of the conference." Yet Macdonald's centralist views should not be overstated. In 1858 he had accepted federation of British North America as government policy, and in 1861 had reaffirmed his support for Confederation in his election address, writing that if Canada was to "succeed in a Federation" it must also secure an "efficient central government." Macdonald spoke of Canada finding the “happy medium,” securing “all the advantages of a legislative union under one administration, with, at the same time the guarantees for local institutions and for local laws, which are insisted upon by so many." As Canada’s first Prime Minister until 1891, Macdonald presided over Canada's expansion to the Pacific, and the accession to Canada of Prince Edward Island, Manitoba, the North-West Territories (Saskatchewan and Alberta), and British Columbia. 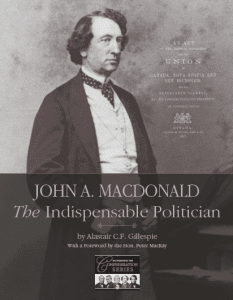 For more on Macdonald refer to the Dictionary of Canadian Biography. The Macdonald-Laurier Institute is pleased to showcase the fifth paper of its Confederation Series, written by Munk Senior Fellow Alastair Gillespie.